Tomlin is the youngest head coach to ever win a Superbowl and the youngest to appear in a second. McCarthy has made a seamless transition from Brett Favre to Aaron Rodgers. Tomlin reshaped his coaching staff to drastically benefit his team; signing offensive line coach Sean Kugler and Special Teams coach Al Everest. McCarthy has gotten the best out of his defense changing from a 4-3 to a Dom Capers coached 3-4. Tomlin went 3-1 with a third and fourth string quarterback at the beginning of the season. McCarthy has plugged an endless number of injuries and still brought his team to the Superbowl. Both Head Coaches are player's coaches, there are no egos negatively affecting team morale. Neither team has sacrificed it's future to succeed immediately thanks to it's GMs and Head Coaches. Both Head Coaches are vastly experienced at relatively young ages. Together, they have a career record of 100-56 including the playoffs. Aaron Rodgers is historically the highest ever rated quarterback through the first four playoff games of a career. Ben Roethlisberger had won 2 Superbowls by the age of 26. Rodgers has a 98 quarterback rating for his 6 year career. Roethlisberger has a 10-2 record in the playoffs. Since becoming the starter three years ago Rodgers has never completed less than 63% of his passes. Significantly he throws a very catchable ball that results in less drops and more YAC yards. He is the most accurate thrower in the league. Roethlisberger's greatest strength is just that. He is one of the strongest players in the league physically, not just among quarterbacks. He can shrug off defenders and force defensive backs to cover for decades. Both players are two of the toughest in the league. Roethlisberger played with a broken nose and foot this year while Rodgers has been concussed twice. Dual Threats, both players can beat a defense with their feet should they need to. Leadership, Rodgers has worked without a running game or his number one target, Jermichael Finley, throughout the whole season. Roethlisberger has one remaining starter from his original offensive line. Work Rate, Rodgers is a fanatical studier of the game while Roethlisberger's attitude towards his fundamentals has improved vastly this year. High powered offenses. The Packers have the ability to score from any position on the field while the Steelers led the league in plays longer than 20 yards during the season. Balance, both teams can win this game with either their defense or offense. The last time these two teams met, the game ended on the final play and was decided by a point 37-36. 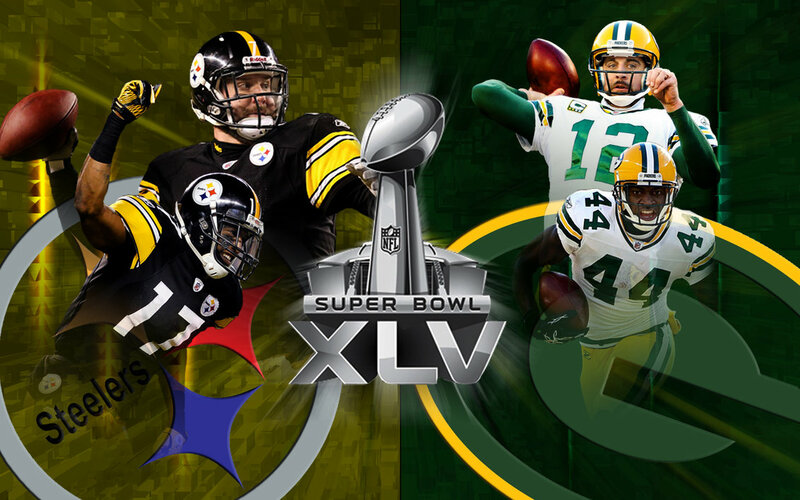 Star Power on both sides of the ball on both teams; Rodgers, Roethlisberger, Matthews, Polamalu, Woodson, Harrison. Frailties, The Steelers are struggling against the pass while the Packers can be exposed by the run. Matchups; Tramon Williams v Mike Wallace, Charles Woodson v Hines Ward, Ike Taylor v Greg Jennings, Troy Polamalu v Aaron Rodgers, Clay Matthews v Flozell Adams, Doug Legursky v Dom Capers. The top ranked defense in the league will face the second highest ranked defense in the league and both are explosive in their attitudes towards the game. Nothing makes a game more exciting than a blitzing defense, if the defense is exposed there will be big plays, if the offense can't cope there will be sacks/turnovers. Young stars to watch, established players such as Mendenhall and Matthews are there but also Emmanuel Sanders, Antonio Brown, Sam Shields, James Jones. Both teams have elite quarterbacks but also most importantly two of the most clutch in the league. It's Dallas! Everything's bigger in Dallas. 12. Don't worry I wasn't really going to leave you with that last one. The Cold weather and fans. Many people are complaining about a cold weather Superbowl but what makes a better setting than snow for the Packers and Steelers even if none of it will actually be on the field. Packers and Steelers fans are some of the best in the League and will create a great atmosphere. The Packers are the hotter team. They have won 5 straight games where it was win or go home. Maurkice Pouncey's loss will make it incredibly difficult for the Steelers to cope with Dom Capers' blitzes. The Packers offense is outrageously good when playing in a dome or controlled environment such as in Dallas. Clay Matthews can beat every single one of the Steelers' offensive linemen in a one on one matchup on every single play. The Steelers' defensive strength is against the run however the Packers do not run the ball and have no desire to do so often. The Packers have 4 wide receivers that can change the game in their favor with one single reception while the Steelers talent at cornerback is questionable. The physical strength of Donald Driver and Greg Jennings will cause problems for starters MacFadden and Taylor for the Steelers especially. The team has overcome it's major problem, injuries, without a drop off in standard. The Packers are motivated and more focused on winning while the Steelers may be taking this trip for granted. Ben Roethlisberger holds onto the football which will give the Packers a chance to take him down often. It's simple. The Packers are the more talented team across the board and as a result have greater depth. Coaching advantage. The Steelers and Packers both have very good coaching staffs. The only difference is slight but important, as Mike McCarthy often makes suspect decisions in time management and challenge calls. Experience. 2 Packers players have Superbowl experience, 19 Steelers have 2 Superbowl rings and the majority of their roster have 1 ring. Their number one ranked defense is led by a hall of fame coordinator and a future hall of fame safety. LeBeau has shown in the past that when given 2 weeks to gameplan he is almost unplayable. The Steelers won 12 games in what is the tougher overall conference while the Packers won 10 and came into the game as a 6th seed. No Packers' defender can keep up with Mike Wallace. Wallace is the fastest receiver in the league and at least the second most explosive to DeSean Jackson. More big play players. Wallace, Roethlisberger and Mendenhall can all make game changing plays for the Steelers on offense while Troy Polamalu, James Harrison, LaMarr Woodley and Lawrence Timmons will all create havoc for the Packers. While others such as Ryan Clark have stepped up throughout the playoffs. No Packers defender can match up to Heath Miller. Miller is a severely underrated tight end who can do anything for his offense blocking or receiving. His huge frame and soft hands will highlight the loss of Nick Barnett. Rashard Mendenhall has been outstanding during the playoffs and the Packers are not strong against the run. Expect to see the Steelers run right over the right side of their offensive line behind Flozell Adams. Preparation. Outside of the players experience the whole team and coaching staff has dealt with the distractions of the media scrutiny before. They have appeared more relaxed throughout.